Photo: Social Media is becoming the defacto standard in restaurants for announcing nightly specials, happy hour and drink specials. This is the inaugural report from Roost regarding SMBs and social media. SMBs in local markets rank social media as not only effective, but it can be fun and save money too. Roost is a company working with local SMBs, finding new SMB customers and helping to increase repeat business via social media.will be releasing quarterly social media reports. Each report will focus on topics and trends for SMB social media efforts. Findings from the company’s inaugural report show local businesses are turning to social media. Here are a few summary items from the report. When asked what their most effective marketing channels were, 71.4 percent of SMBs polled by Roost reported ‘Social Marketing’ – more than four times more than the 15 percent who responded with traditional ‘Paid Search Marketing’. In addition, a full 87.3 percent believe social marketing is either ‘Somewhat Important’ or ‘Very Important’. Of the social networks local business tend to use most, 84.1 percent reported Facebook was the most effective for their business. -What is your most effective marketing channel? -How important is social marketing? 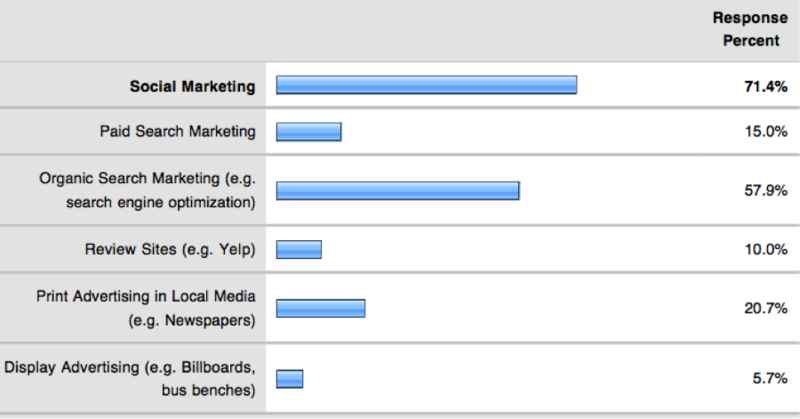 -Which social network is most effective for marketing your business? -Social Marketing Affects the Bottom Line -Why do you use Social Media to market your business? (user was asked to pick top 3) -What problems have you had with Social Media? When asked why they use social media to market their SMB, the number one answer was ‘Saves me money’ with 46.1 percent. And it turns out social marketing is not only good for the bottom line, but for bringing enjoyment to the work day, as nearly 45 percent of respondents chose ‘It’s a fun way to interact with people’ as the main reason they use social media. Tied with ‘fun’ was ‘Keeps me top of mind’, which got 44.8 percent of the votes. Although it is considered an effective and fun marketing channel for most of the Roost respondents, it turns out social media does not come without it’s challenges for local businesses. Just over 45 percent reported ‘Not sure how to measure success’ as their biggest problem with the medium, with ‘I didn’t know what to post’ close behind at 38.5 percent. Roost will release its next report on Local SMBs and Social Media in September, 2011. The next topic will address how local Facebook Friends and Fans are releative to the businesses they follow. To participate in this survey, go to Roost and get your Roost Local Scorecard. Headquartered in San Francisco, California, Roost is a unique social marketing platform entirely focused on helping SMBs and independent professionals manage their social presence and engage with their customers across key social networks, such as Facebook and Twitter. Roost has more than 30,000 people across over 50 industries using its social products. Roost's executive team is comprised of SMBs and social media experts from Walmart.com, Merchant Circle, Flixter and Social Gaming Network. The company is venture capital funded by Shasta Ventures and General Catalyst. To jumpstart your local business’s social marketing efforts visit http://www.roost.com.